Target Corporation (TGT) operates general merchandise stores in the United States. The company is a dividend champion, which has paid dividends since 1965 and increased them for 46 years in a row. The company’s last dividend increase was in June 2013 when the Board of Directors approved a 19% increase to 43 cents/share. The company’s largest competitors include Wal-Mart Stores (WMT), Dollar Tree (DLTR) and Costco (COST). Over the past decade this dividend growth stock has delivered an annualized total return of 7.60% to its shareholders. 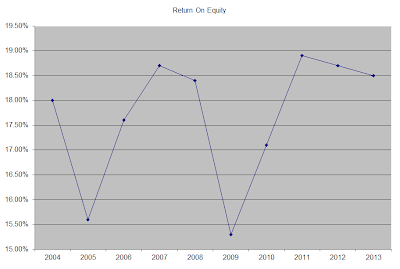 The company has managed to an impressive increase in annual EPS growth since 2004. 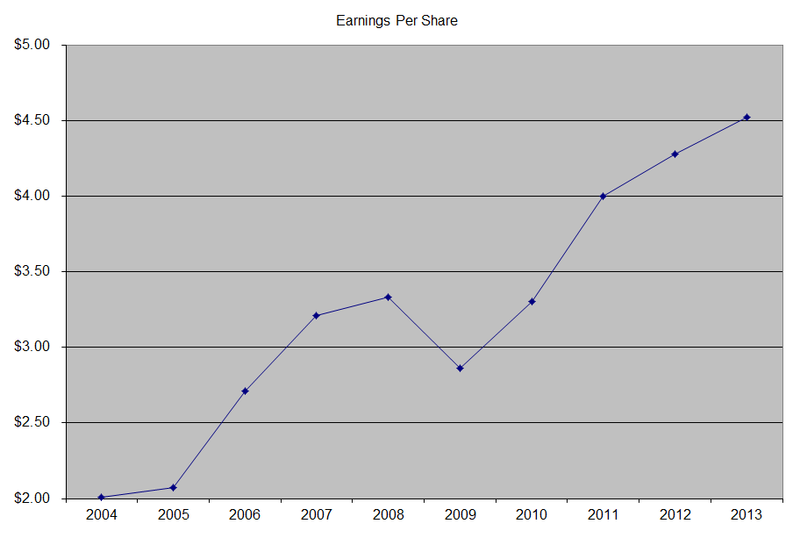 Earnings per share have risen by 9.40% per year. Analysts expect Target to earn $4.36 per share in 2014 and $5.46 per share in 2014. In comparison Target earned $4.52/share in 2012. Future growth would likely be focused on expanding same-store sales and renovating existing stores, rather than simply by opening a large number of locations. Future growth could be realized by the increased penetration of the RED Card, which the company’s cashiers keep promoting to customers. This decreases expenses related for transactions processing of other credit cards. Another venue for growth that could increase the number of customer visits is the remodeling of its stores, which would add fresh foods to the stores. The company is targeting middle-class and upper income consumers, which are more interested in quality and diversity of product offerings, rather than simply looking at the lowest prices. It has in essence managed to differentiate itself from Wal-Mart (WMT), while also retaining its status as a discounter. The company also is on track to bring the number of stores in Canada to 125 by 2013, which could increase long-term profits. Currently, the costs associated with jumpstarting its Canada operations have been dilutive for earnings, and would be for the next few years. Target Stores has a goal of earning $8/share by 2017, which would be driven by 5% sales growth in US, share repurchases, store openings in Canada, as well as square footage growth. Risks to growth include worsening of the economy, failure to execute its strategy of effectively differentiating itself from arch rival Wal-Mart as well as credit card risks. 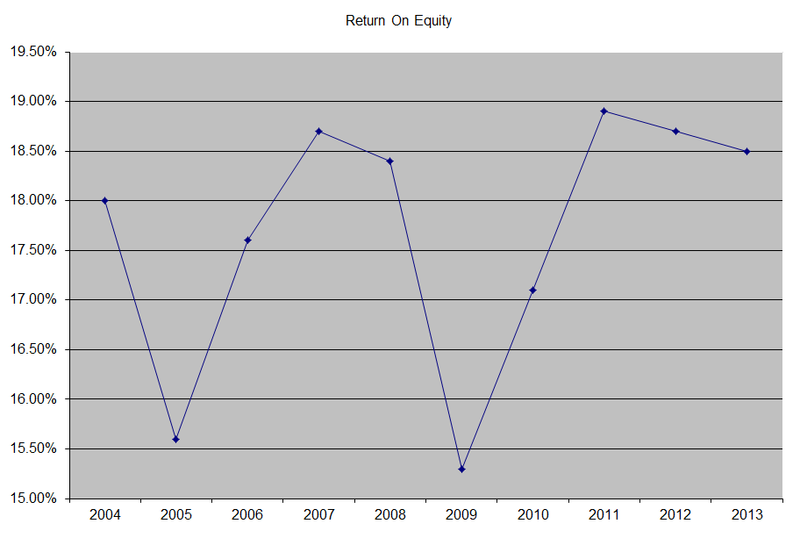 The return on equity has remained consistently in a tight range between 15% and 19%. Rather than focus on absolute values for this indicator, I generally want to see at least a stable return on equity over time. The annual dividend payment has increased by 18.60% per year over the past decade, which is higher than to the growth in EPS. 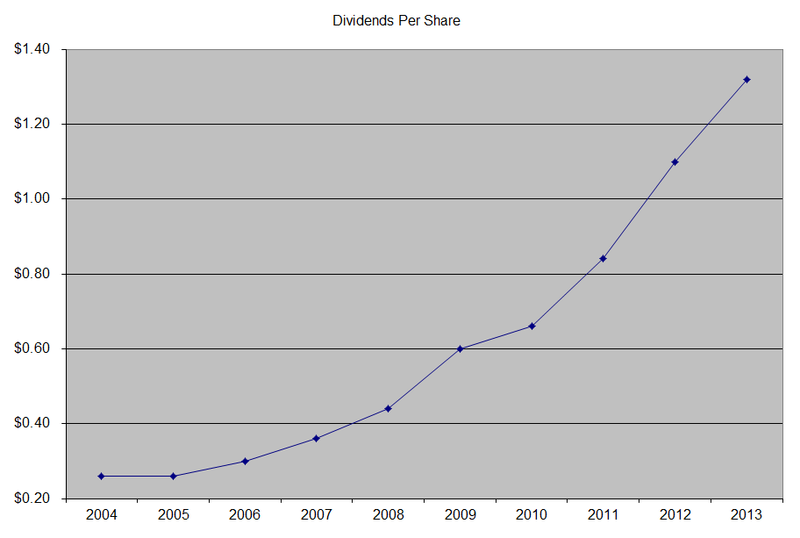 An 18.60% growth in distributions translates into the dividend payment doubling every four years. If we look at historical data, going as far back as 1974 we see that Target has actually managed to double its dividend every five and a half years on average. 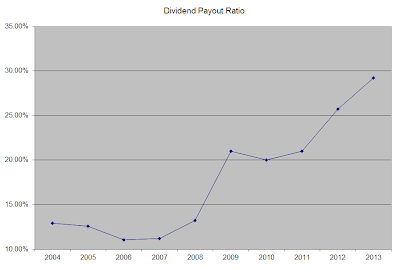 The dividend payout ratio has increased from 13 % in 2004 to 29.20% in 2013. The expansion in the payout ratio has enabled dividend growth to be faster than EPS growth over the past decade. A lower payout is always a plus, since it leaves room for consistent dividend growth minimizing the impact of short-term fluctuations in earnings. Currently, Target Stores is attractively valued at 16.90 times earnings and has an adequately covered dividend but only yields 2.40%. In comparison, rival Wal-Mart (WMT) trades at 15.10 times earnings and yields 2.50%. Target could be a decent addition to a portfolio on dips below $69; however Wal-Mart (WMT) continues to be my preferred way to play big box retailers. - Your Retirement Income is on Sale!